21 February 2018: Last night — while most of us were dreaming, snoring and snuggled up warm in our blankets — Australia reached a new milestone in cancer research. Thanks to the hundreds-of thousands of everyday 'Dreamers' plugging in their phones and pressing 'play', the app finished its final calculations on Project Decode in half the time it would have otherwise taken, paving the way towards the discovery of new, more effective cancer treatments. The award-winning app*, built in partnership with the Garvan Institute of Medical Research and the Vodafone Foundation, is the first of its kind to use the idle processing power of smartphones to speed up the rate at which cancer research data is crunched. Project Decode — the first of two cancer research projects running on the app — was created to understand cancer based on a patient’s DNA profile, rather than the tissue in which their cancer started (in this case, breast, ovarian, prostate and pancreatic cancers). “There are many important research questions we’d like to ask, but some need so much computing power that it would cost too much, or take us years and years. DreamLab has given us free access to a dedicated virtual supercomputer to accelerate our cancer research, giving more hope to patients and their families,” says Dr Warren Kaplan, Chief Bioinformatician at the Garvan Institute of Medical Research. Last night, the app finished its final calculations on Project Decode in half the time it would have otherwise taken, paving the way towards the discovery of new, more effective cancer treatments. Image: A comparison of over 350 breast cancer tumour genomes to each other. “These are exciting results because they show us that we can do what we hoped – assign an individual’s cancer to a particular group and one day treat it on the basis of its genetic information,” says Garvan Institute Chief of Informatics, Dr Warren Kaplan. 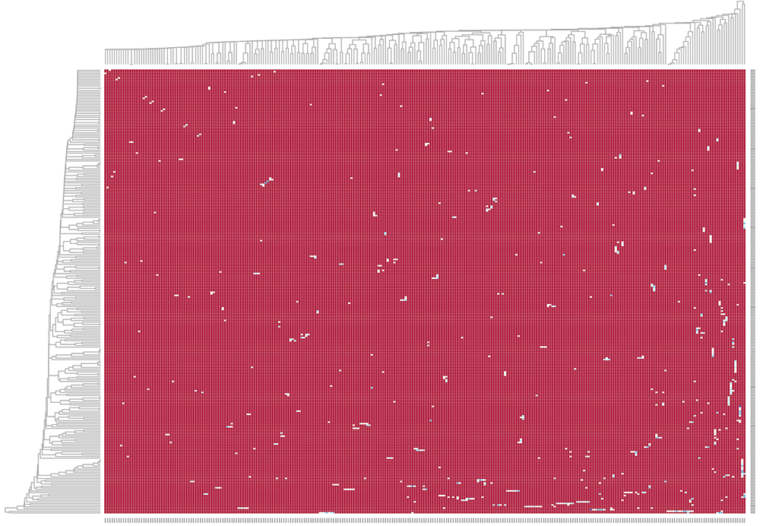 The above graphic looks like a red, star-speckled sky, but it’s actually an initial map of the genomes of 350 breast cancer patients. White clusters pop from the background – conspicuous and ‘promising signals’ that highlight similarities between the genomic information in each cancer. Packaged together with the genetic information from the other three cancers in the project, Garvan Institute Chief of Informatics, Dr Warren Kaplan says it shows “strong signals, indicative of distinct signatures” which pave the way for larger insights on the hidden genetic similarities between breast, ovarian, prostate and pancreatic cancer. The next step is a deep-dive into the results. “We have started analysing the results of the DreamLab App generated data and are excited to already be seeing some interesting patterns that we will explore further. In June we plan to report our findings in a research publication,” he says. The aim to share findings later this year will no-doubt benefit researchers and the millions of people affected by cancer globally. Completion of Project Decode is also a testament to the power of everyday people to contribute towards new scientific discoveries. Thanks to the amazing work of 121,000 active ‘Dreamers’, Project Decode’s whopping 25 million research calculations were solved in triplicate (to validate the results) – 75 million calculations in total. That’s more than 600 calculations completed by each user, on average — a terrific effort by the little computers in our pocket. Beyond the calculations and computing power, though, for people like Canberra mum Sarah McGoram, the completion of Project Decode is a spark of hope on the horizon. Sarah suffers from a rare form of intestinal cancer with limited treatment options and no known cure. For her and her family, the discoveries made by cancer research can be a lifeline. “As a cancer patient for 21 years I have had plenty of moments waiting for research to find solutions to my rare cancer. It can feel like a long slow wait,” she says. “Powering the DreamLab app each night gives me a sense of contributing to the research. If I can help the researchers get their data one day faster by powering DreamLab, then it is worth it.” – Sarah McGoram, mum and cancer patient. To Sarah, it’s in everyone’s power to help – including her her own family. Her 11-year-old son, George, even contributes to DreamLab, powering it on devices at home and school. Sarah’s father and sister also muck in to crunch data each night. “DreamLab and cancer research is important to me, because I want Mum to get better and feel better. I just want all people with cancer to get better,” says George. For thousands of us ‘Dreamers’, there are still more ways to help: Project Genetic Profile needs users to help calculate genetic similarities between brain, lung, melanoma and sarcoma cancers. Download DreamLab on iOS from App Store and for Android on the Google Play store, and you can join in helping solve cancer – while you sleep. A compatible handset is required. Downloading DreamLab will consume data. Once downloaded, DreamLab can be used when your device (i) is connected to a charging source and (ii) has mobile network or WiFi connectivity. Mobile data to use DreamLab is free for Vodafone Australia customers on the Vodafone Australia network. Roaming incurs international rates. Working closely with our partners The Garvan Institute and Hello Sunday Morning, Meg helps the Vodafone Foundation live out its day-to-day purpose of using technology to improve the health and wellbeing of Australians.